One of the design ideas during development stages of the St Helens Park skate park. 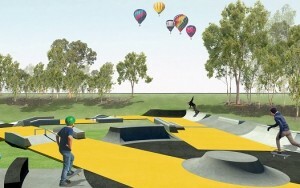 Campbelltown’s newest skate park, located at St Helens Park Reserve, will be officially opened on Saturday, January 30. Part of the opening day celebrations will include skate, scooter and BMX showcase, music and free barbecue between 11am and 2pm. The park is the third of its kind in Campbelltown, complementing existing skate park facilities at Leumeah and Macquarie Fields. It was planned after extensive consultation with young people, local residents and interested groups to ensure the facility would be enjoyed and valued by the whole community. Designed to provide a unique experience for wheeled sports users of all ages and skill levels, the park includes elements for skateboarders, in-line skaters, BMX riders and scooter enthusiasts, offering fun ramps and curves for beginners as well as challenging transitional walls and rails for more experienced skaters and riders. The skate park has an automated amenities building nearby, as well as safety fencing along Appin Road, and security lighting. Mayor of Campbelltown, Cr Paul Hawker, said the project has been a huge success, completed on time and to budget, after extensive consultation with local youth and residents. “It’s wonderful to see such strong community involvement in the development of new facilities,” Cr Hawker said. “This new skate park is part of a much larger vision for St Helens Park Reserve, with council recognising the need to create a recreational destination at the southern end of the city, for residents and visitors alike. “Council has engaged a consultant to develop a master plan for St Helens Park Reserve, which will highlight opportunities for possible recreation and cultural activities, advancing the reserve as a future regional park,’’ Cr Hawker said. Skaters and riders are reminded to take their safety gear, especially their helmets, to the opening day on January 30. For more information on the St Helens Park Reserve master plan, visit the website here.